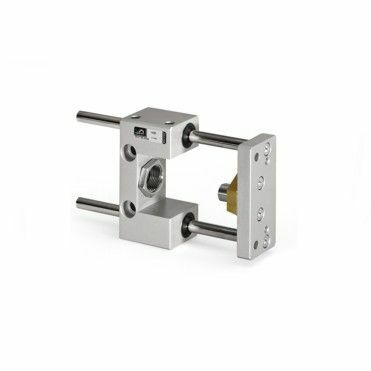 The linear control units GLC series can be assembled to cylinders in compliance with ISO 6432 and ISO 15552 standards. Anti-rotation is guaranteed by two guide stems, whose movement is supported by four brass bushes in BS version. The use of high quality materials and precision manufacturing techniques gives the units excellent performance with high resistance to side loads. Versatility of mounting is assured by either mounting directly to the unit, or by the use of standard accessories. The unit is supplied already lubricated. BORE Select 20mm. 25mm. 32mm. 40mm. 50mm. 63mm. 80mm. 100mm.